Third in a series of “throwback” posts. This review was written at the end of summer 1987, when the author was 17 years old, just out of high school and scooping Abbott’s Frozen Custard for the cash to rent VHS movies every night. 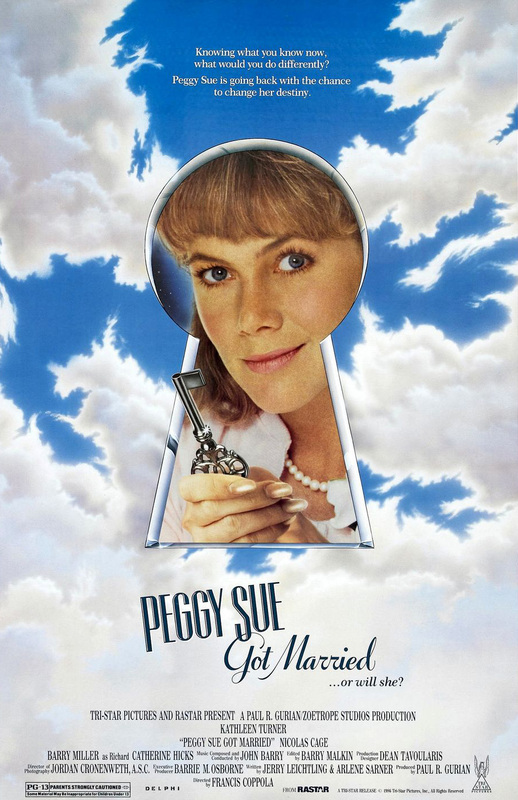 Peggy Sue somehow loses consciousness at her high school reunion and finds herself actually back in high school and reliving her youth. The movie has been criticized because it’s not entirely logical about how she got there, or how she gets back. The contrived logic is weak, but it’s not meant to be taken as a literal time travel story; it’s not important to me whether she was really there at all. I think the point is to simply observe the situation. If you can get beyond the initial suspension of disbelief, the movie is magic. It’s nostalgic, but with the opportunity and dilemma of “would I/should I do the same thing again?” It’s interesting for me, just out of high school, because I can imagine coming back to where I am now. I wonder what the older and wiser me will think, and what I’d consider changing. See this with someone you love, because it’s romantic, funny, and suited to couples. It’s fun in groups, except in groups almost everyone falls asleep (you know who you are.) The movie makes you feel good. It’s also one of those, “put as much meaning as you want into it” kind of movies. I started listening to Buddy Holly because I couldn’t stop singing the title tune. Posted in Movies and tagged Movie Reviews, Throwback Reviews. Bookmark the permalink.